Does the future of city transport roll on two wheels? 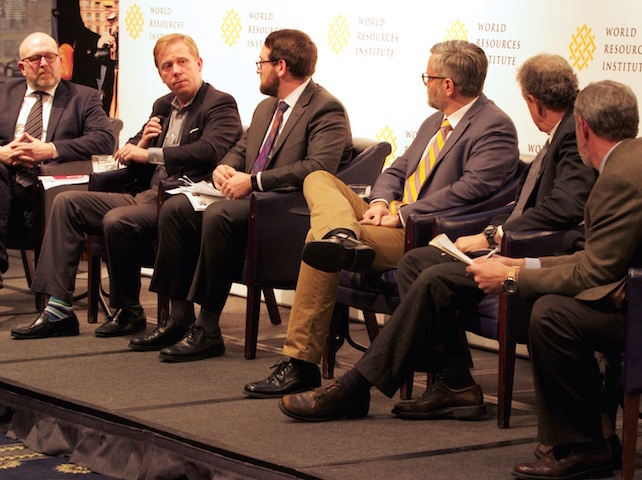 After a nearly three-mile bike ride from World Resources Institute to Washington’s National Press Club, advocates of city cycling offered advice on how to make bicycles a healthy, economical, environmentally sustainable mode of urban transportation. This is already a reality in Copenhagen, where half of all workers commute by bike and biking accounts for 17 percent of all trips and 50 percent of all work commutes around Denmark’s capital, according to Klaus Bondam, Copenhagen’s former technical mayor, who participated in the panel discussion on January 11. The typical worker in Copenhagen spends only 4 percent of income on commuting, compared to those in Houston, where the cost is 14 percent of a typical worker’s pay. In Washington, a relatively bike-friendly U.S. city, only 4 percent of commutes are by bicycle. Panelists offered five steps cities can take to persuade more commuters to trade four wheels for two. 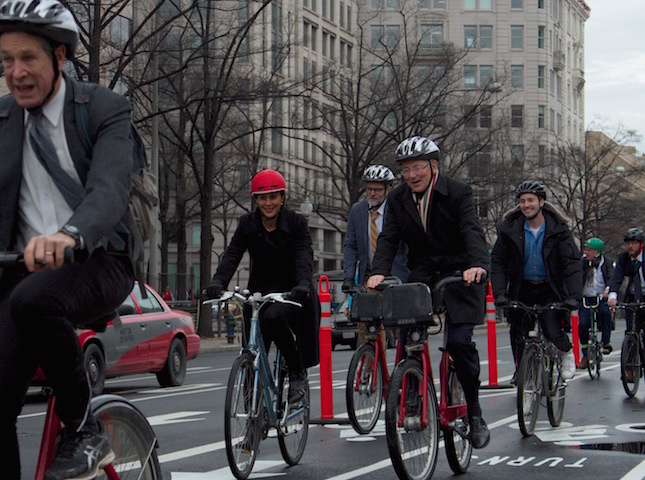 Let city leaders know that bike riders can mobilize as a political force. Sam Adams, WRI’s U.S. director and former major of Portland, Oregon, noted that cyclists were consistently ignored until they formed a Bike PAC which endorsed candidates and made donations. Even though the sums involved were small, politicians began to pay attention to the cyclists’ concerns about safety and the need for better infrastructure. Finding common concerns among all stakeholders is key, and a good place to start is the urban economy. Traffic can drag down economic growth, at a rate ranging from 1.1 percent in New York City to 15 percent in Beijing. “One of the key strategies in Denmark has been the National Bicycle Strategy, which brought together all different stakeholders and created a common language in the field,” Bondam said. Building public support for urban biking requires the same tools used to raise the public health hazards of smoking. Encourage cycling by making room for cyclists. New bike-friendly infrastructure brought a 24 percent rise in Copenhagen ridership, with a 63 percent increase in a feeling of safety, Bondam said. When choosing where to build, prioritize use and accident reduction, as well as linkage of cycletracks to create full networks. Building “cycle superhighways” that link suburbs with inner cities can be particularly effective. Shared bike platforms, like the Bikeshare system in DC, also play an important part in increasing ridership. Biking needs to be integrated with other modes of transport. That means ensuring that buses have bike racks, and making it easier for riders to bring their bikes on trains – a measure that helped expand the commuting range for cyclists in Copenhagen. In Copenhagen, a poll showed that only 5 percent of respondents said they bike for environmental reasons – 56 percent said it’s faster, and another 27 percent said it’s more convenient. More than a quarter of respondents said they bike because it’s healthier. Bondam jokingly said that Danes like biking because it flatters their Viking roots—“there’s a sense of conquest when you get to the office”—but there’s plenty of research that suggests employees are happier, healthier and more productive when they get in a bit of exercise on their morning commute. And it’s not just healthier for the cyclists. More bikes on the road means fewer cars, which decreases pollution. 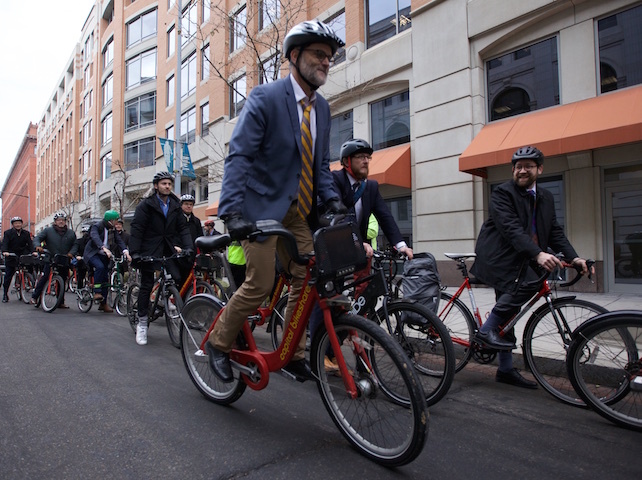 Lars Loese, the Danish ambassador to Washington who also attended the event, said 50,000 Americans die every year from pollution, a problem biking can help alleviate. Bondam also emphasized the degree to which biking is an activity through which families bond in Denmark; more than a third of Danish families bike with their children. Danish kids start learning cycle games in kindergarten. Nothing happens overnight. When asked how long it might take for residents of a U.S. city to embrace biking as Copenhagen has, Bondam responded cautiously: “A long time. Fifty years, maybe.” Not only do investments in infrastructure need to be made, but it takes a long time to internalize the culture of biking into a city’s DNA.